Every year since 1948, the Gallup Polls publishes a list of top 10 “Most Admired Man” and another for the “Most Admired Woman” on earth. Since then, the highest number of appearances a single person has made on either list is 61. Incidentally, that person is Billy Graham (now of blessed memory). Billy tops these prestigious lists far ahead of personalities like Queen Elizabeth II (49 times), Margaret Thatcher (34 times) and President Ronald Reagan (31 times). Some other interesting people on these lists are Oprah Winfrey (30 times), Jimmy Carter (28 times), Pope John Paul II (27 times) and Nelson Mandela (20 times). Then on December 9, 1992, The New York Times (NYT) published an article entitled ‘The Transition; Billy Graham To Lead Prayers’. The article reported that Billy Graham had been billed to lead the prayers at the inauguration of Bill Clinton as the U.S. President. What’s more? The article described Billy as “the evangelist who has been a spiritual adviser to several presidents”. The Billy Graham Evangelistic Association (BGEA)’s website corroborates this NYT claim in an article entitled Billy Graham: Pastor To presidents. The BGEA article claims that every U.S. President since the second world war has sought an audience with Billy Graham. With such an absolutely imposing personality, who is this Billy Graham really? What did he have to offer that made a long line of 13 U.S. presidents willingly seek his counsel as reliably reported? What are the influences that shaped Billy Graham’s life and made it so legendary? These and many more are the questions we will be trying to answer in this short but incisive piece. Billy was born William Franklin Graham Jr on November 7, 1918. His father was Franklin William Graham Snr and his mother was Morrow Graham. Not lucky enough to receive even the most basic maternity care at birth, Billy was born in the bedroom of a farmhouse his family inhabited at the time. His father was a country dairy farmer in Charlotte North Carolina and he raised all of his children in the Reformed Presbyterian Church which formed the foundation of Graham’s service to God and the church. But, at the age of 16, young Billy began to meet the influences that would ultimately define the unique path of his faith and career. That was when he got a peculiarly strong interest in the preaching of an itinerant evangelist named Mordecai Ham. With this interest, Billy attended series and series of Ham’s evangelistic meetings. We have no information as to where Billy Graham attended elementary and high schools. But the information available shows that he went to Bob Jones College (now Bob Jones University) in Tennessee. He went there specifically to enroll in the college’s conservative Christian school as a result of the impact Ham’s preaching had on him. But then, he soon found the school too legalistic and left it. After this, Billy Graham went to Florida Bible Institute where he got a bachelor’s in theology preparing to become a pastor. He eventually received ordination as a pastor under the Southern Baptist Convention Church. Still hungry for more knowledge, Billy went to the prestigious Wheaten College where he studied anthropology. That was also where he met his wife Ruth. Billy married Ruth in mid-August 1943. 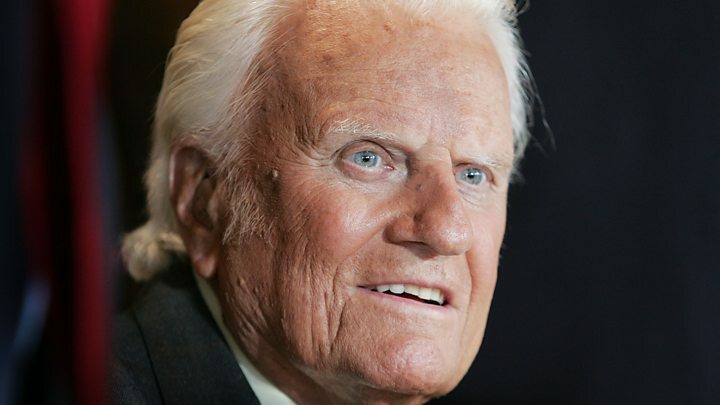 After pastoring a couple of local churches for a few years, Billy Graham’s work as an open-air evangelist began in 1947 when he was 29 and took up all of his lifetime so that by the time he was dying in 2018, it was reported that he had conducted over 400 crusades in more than 180 countries and territories spread over six continents! However, an important part of Billy’s work on earth that no one seems to talk much about is his civil rights activism. His relentless criticism of the arrogant racial stance of his fellow whites helped the work of Martin Luther King Jr a lot. At a time that racial segregation was at its peak in the US, Billy Graham used his gospel crusades as an opportunity to encourage racial integration. In one case, he is reported to have torn down the ropes the organizers used to separate people of different races at his meeting. Billy Graham married his wife Ruth on August 13, 1943. He was around 25 then while Ruth was 23. The couple remained married until Ruth’s death in 2007. In their 64 years of marriage, the couple had five children together: The first child Virginia Leftwich was born in 1945. Ann followed in 1948. The third child Ruth was born in 1950. The fourth child and first son Franklin was born in 1952. Then Nelson Edman, the last child, and second son was born in 1958. Ultimately, each of Billy Graham’s children took after him in ministry one way or another. For instance, Virginia is a popular speaker and author. Ann runs a Christian organization named AnGel Ministries. Ruth is the Founder and President of Ruth Graham And Friends which hosts conferences across North America. Franklin currently serves as the president of Billy Graham Evangelistic Association and its charity arm, Samaritan’s Purse. Finally, Nelson is the head of East Gate Ministries International which is carrying out literature-based Christian evangelism in China. As you should expect, Graham has so many grandchildren. There is William Graham Tullian Tchividjian who is a former pastor and Christian book author. He wrote One Way Love and It Is Finished. There is also Will Graham, an evangelist and author too. Will wrote Redeemed: Devotions For The Longing Soul. Then, there is a particularly fiery granddaughter of the great preacher named Jerushah Armfield who shares her grandfather’s dislike for racial prejudice. She is an avid critic of President Donald Trump. She also criticizes white American evangelicals for being racist against former President Obama while condoning the excesses of President Trump. In his over 70 years in the ministry, Billy Graham wrote no less than 34 books, many of which became bestsellers as soon as they were published. Currently, all these books are still earning royalties. Although a huge part of these earnings is said to be going to charitable causes via his organization, Samaritan’s Purse, Billy’s estate still retains a substantial amount. So, as of 2019, Billy was reportedly worth an estimated $25 million. Billy Graham suffered from hydrocephalus from when he was 74. From then on, his health continued to fail and his public appearances became rare. Yet, he kept using every opportunity at his disposal to preach the gospel. Eventually, Billy died at the age of 99 on February 21, 2018. His death occurred at his home in Montreal, North Carolina. After a private funeral on March 2, 2018, Billy Graham was laid to rest beside his wife at the Prayer Garden in Billy Graham Library. Billy Graham died just months to attaining the symbolic centenary age.